Joy Creek Photo Archive (c) all rights reserved This selection was made by New Zealander Eddie Welsh. 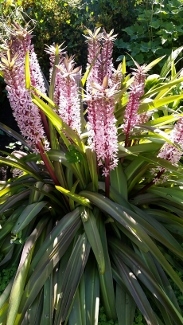 Of all the Eucomis we grow in our gardens, this is the smallest and perhaps the easiest to accommodate in a smaller space. The green, strap leaves are shorter and less wide but the pineapple-like inflorescence is every bit as lovely rising to almost two feet. The individual flowers are ivory with purple centers. The seed capsules are an attractive red. Try the lilies in cut flower arrangements. July and August. 18 in. x 24 in.